In December 2014, our office moved from Downtown Los Angeles to Irwindale, CA. My commute went from 7 miles to 25 miles. At the same time, our office environment went from private offices to cubicles. To be fair – I was well informed about this before I signed up for the job. (Read Part I of this story first here). Later, my co-worker mentioned this to my boss. So one random afternoon, my boss walked into my office, sat down and explained what she’d heard from my co-worker. She recommended I submit the HR paperwork for accommodations to make sure we had everything in order to get what I needed in the new office. It was a surreal moment. My boss had used the word “we” – like she and I were on a team to secure the accommodations. Once my boss brought it up, I filled out the HR paperwork quickly, knowing I would request a private space with a lock on the door to take one or two short naps daily. When the HR representative called me to follow up, I explained that I didn’t care how big the room was or if it was used for other purposes (like a mother’s nursing room or storage closet), as long as there was a lock on the door and something to lay on – ideally a couch or recliner, but even just space to roll out a yoga mat would work. I began this process in early December and the nap room situation was fully resolved by mid-March. So, it did not happen overnight. It was a process. It took a team, communication, coordination and patience. During this three-month process, I must admit that I was extremely sensitive when discussing the nap room. When my boss mentioned it, I clammed up and couldn’t express myself well. She could tell how uncomfortable I was, especially in meetings with the HR representatives, and went along to make sure I was okay and that I got what I needed eventually. Still, I cried on several occasions in my cubicle, and after one particular upsetting interaction about the nap room, I couldn’t bring myself to go into work the next day, so I called in sick to calm myself down for a day. I can’t pinpoint why this was so highly emotional for me. In part, I felt like I was being forced to talk about something I’d rather not discuss at all. I felt exposed and naked, and at the mercy of HR representatives who knew almost nothing about me or my narcolepsy. 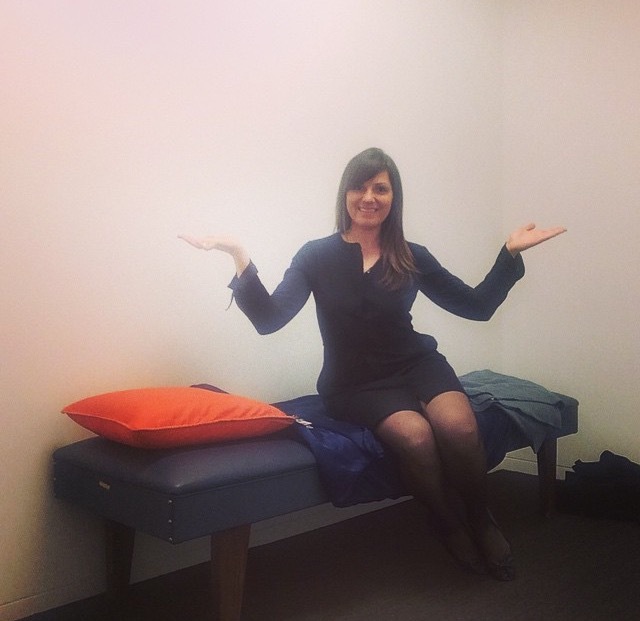 As soon as we moved into our new office in mid-December, my boss was on the hunt for a nap room. It never slipped her mind, quite the opposite; she was looking for possible rooms on her own, checking in with HR and helping to move the process forward. In meetings with HR, we inspected a few room options together and decided on a private phone room that had a lock on the door. A cushioned bench (see photo above) was moved into this room for me. I liked the space and felt surprisingly comfortable napping there. About half the time I went to nap there, it was occupied by other employees making phone calls because it was still a phone room too. The room would be locked for a day or two before I realized no one was actually using the room, it had just been mistakenly locked. When I reported this to HR, they said they’d “look into it”… After a day without action, my boss went to the front desk security guard to get the room unlocked. When this happened a second time, I went to the security guard and explained that the room was mistakenly locked but I needed to use it for my disability. The security guard seemed confused but went along with me to the room, we knocked loudly then unlocked the door. Much to my surprise, there WAS a woman in the room on the phone. Opps! Dealing with this on the verge of a sleep attack, when my cataplexy is more prominent, was uncomfortable and embarrassing. My boss and I requested to HR that the phone room be renamed a “Wellness Room” and the phone removed, so that it would be a more designated space. Instead, the bench was moved without warning to the nearby mother’s room – squeezed behind a mini-fridge and other furniture. In a building with 800 employees, this room was also very busy. At this point, my patience wore thin. That’s when the advocacy beast in me finally came out of her cage. I met with my boss and my boss’ boss and expressed that while I was so thankful for their support, I didn’t feel that everyone involved was treating my narcolepsy with the urgency and respect that it deserved. I did not say this eloquently, but I said what I needed to say. Thankfully, I was speaking to two extremely kind people, who LISTENED. In retrospect, I think the fact that I’d gone six months without a designated nap space made it seem as if I could tough it out. But something in me had shifted. On the days that the nap room was available, I’d re-discovered how invaluable my naps were. Once I started feeling the benefits of napping, I quickly became intolerant of NOT being able to nap. So when the nap room door was locked, my stomach knotted as I walked back to my cubicle, knowing I had to “fight through it” with my eyes open. It was torture. Julie this is an amazing story, thank you so much for having the courage to share your vulnerabilities with us! It’s a great reminder that we need to work within our limitations in order to achieve balance! Lately I’ve been guilty of doing just the opposite! I began working in home hospice this past May and I absolutely LOVE my job. It’s a part time position which is perfect for balancing my energy levels and time with my family. However, we’ve had a steady rise in patient census and began the process to hire more RNs. Long story short, I’ve been working 10-16 hour days, 6 days a week, since June. There has been no balance to say the least! But there’s a happy ending! Next week is the final week I’ll be training one of the full-time RNs we hired. The following week is the week before my kids go back to school and I requested the whole week off to spend with my family! And when I return to work I will truly be working part-time hours! My supervisor and co-workers have all been very supportive and have recently been made aware of my narcolepsy diagnosis. Although a temporary increase in workload ended up being dragged out across three long months, I now have boundaries in place going forward. Thank you again for all that you do Julie to empower the narcolepsy community while also reminding us that we’re only human. Working With Narcolepsy Parts I and II have really hit a tender spot in my heart! Previous post: Working with Narcolepsy: Part I – I Fought the Nap and the Nap Won.